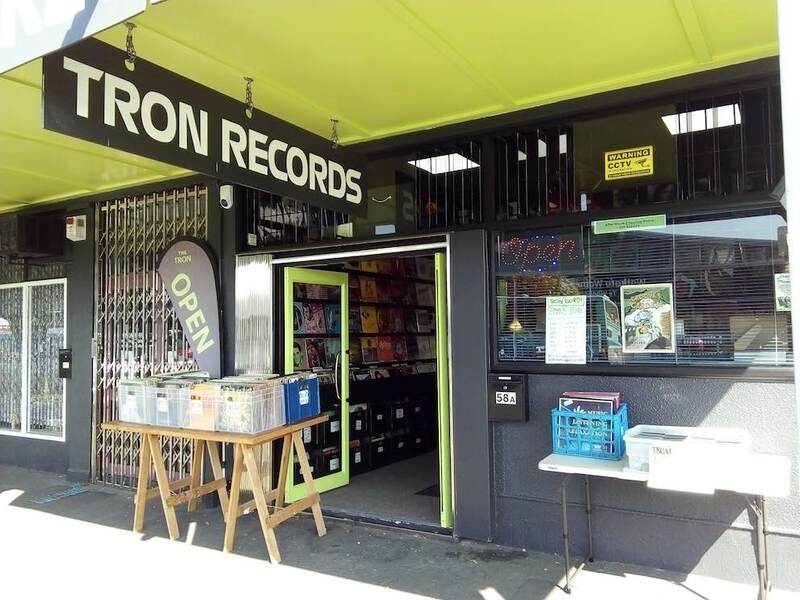 Hamilton’s Tron Records’ store manager Grant Petersen and owner Kerry (Rocky) O’Rourke sat down to discuss the store’s beginnings, future, customers and plenty more. Transcribed by RICHARD VAREY. In recent years, Hamilton became a bit of a wasteland for record outlets. Then a new store opened in Frankton in November 2017. On their first anniversary, I wanted to know more about Tron Records, and helpfully store manager Grant Petersen talked with owner Kerry (Rocky) O’Rourke to answer my questions. Grant: What was your motivation for opening an independent record store when others were closing? Rocky: I love music and also because I do things differently. Quite often impulsively, but I always use my gut feeling in the end. That’s served me well over the years. I take on board other people’s advice, but in the end it’s my call. Grant: So just on the spur of the moment you decided to open a record store? Rocky: I started collecting records like I was collecting coins and stamps, and thought, “Nah, it’s gotta be something better than this”, and I love music, so I started collecting records. Then all of a sudden I started getting a roll-on. Within six months I had thousands of records and I thought I should look at a shop. Then I chatted to a mate and things just fell into place. I had to renovate an old run-down Print House building in Commerce Street. Cut a hole into a concrete wall, put in a door and called the place Tron Records. Grant: You had the shop and then you had the stock, and how long did it take you after making the decision to actually open the doors? Rocky: Six months. Because it was a lot of work getting stock, checking the stock, and renovating the building to shop standard. Grant: Knowing what you know now would you do it again? Rocky: I’ve even thought about opening up a second store in Rotorua. Rocky: I’m a painter and decorator by trade. I’ve always had music in the blood. I can’t sing, I can’t play a note, but I’ve been a part-time DJ most of my life. I do one or two gigs a year, weddings, whatever. Grant: How old were you when you started doing that? Rocky: I started DJing at around 18 and had a natural flair. Then, back in the ’80s and early ’90s I had a night club called Rockerfella’s. Twenty-eight years later I open a record store 300 metres away from where I had the night club. When I had my night club was when I got into NZ music. Rockerfella’s supported all the touring alternative NZ bands as well as giving up-and-coming bands a venue to play at. It was very similar to Nivara Lounge. Grant: It would have been an interesting time to be there. Rocky: Yeah, was a great time. Met some good people. Grant: What do you want record buyers to know about Tron Records? What makes it particularly interesting? Rocky: Well, we’re a boutique shop for starters. 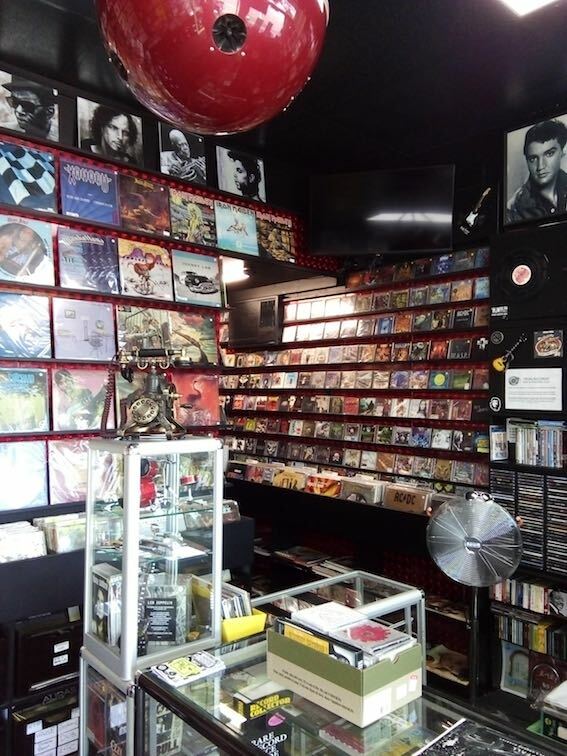 I do want to create an image of being an underground vinyl music shop that caters for all sorts of genres: Classical, jazz, folk, ’60s, ’70s, ’80s, soul, funk, blues, rock, classic rock, punk, new wave, electronic, house, hip-hop, etc. Tron Records will endeavor to find or source records from overseas and bring them in for our customers. Grant: So, it’s a more personal service? Grant: Rather than being a big anonymous store? Rocky: Absolutely. 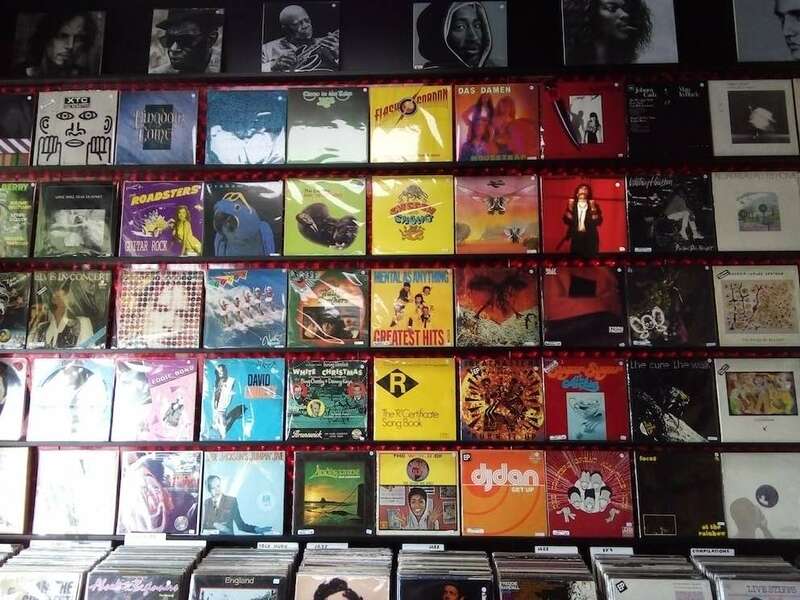 We’re not trading on-line as such, so we just prefer to keep it simple and give customers that personal experience like when you’re young and you come into a record store for the first time. It’s exciting for them. Grant: What do customers ask you for most of all, genre-wise. Rocky: There’s no set genre at all. I didn’t give a thought about punk but it’s very popular. New wave is very popular, but you can’t tell when somebody comes in, you can’t tell what their interest is. Like this guy this morning with the pink mohawk, he wasn’t even interested in the punk records, just classic rock. Grant: It’s also an insight into a person. You get to know people at an op shop, for example, and occasionally they’ll say, “We’ve got a whole lot of records and would you like to look at them? ” and you look through the records and this person’s tastes are just so interesting. Rocky: I can relate to that and interacting with the sellers and buyers. Rocky: Yeah, when people start talking about music in here it’s great. Grant: Yeah it is. And a love of a topic is really infectious, so even if it’s a music that you don’t know, that you haven’t wanted yourself, when you hear somebody talk about it it’s great because it gives you this way and this little key in to listening to it, so the next time you listen to it you won’t hear, you know, some mercenary pop. Instead it’s something someone loves and it’s easier to get that key into it. Rocky: Yes, and then you have a little bit of knowledge about what you’re listening to – it gives it that extra bit. Grant: What’s the oddest thing you’ve been asked for? Rocky: Records in my oddball section: The Goons, Monty Python. Grant: And what’s next? What are your plans and ambitions and have you got any events coming up or anything like that? Rocky: Well, my ambition is to get the shop how I want. I’m possibly only halfway there. Grant: So more more of the same, only bigger? Rocky: No, happy with what’s here, just need more marketing. Grant: Yeah, because we’re in a bit of an out of the way place here, right? We don’t get a lot of people walking past, so we need to get some word of mouth and so on. Well, I think we really can be a little bit funky with our sign writing as a store. Rocky: I do agree with you. Rocky: Yes, we plan on having singles, that is 7-inch 45s in the near future. Tron Records is at 58a Commerce Street, Frankton, Hamilton.